Does time pass faster in deep space than here? This web site is protected by copyright law. Reusing pictures or text requires permission from the author. For more topics, scroll down, press Ctrl-F to search the page, or check previous months. For the latest edition of this page at any time, create a link to "www.covingtoninnovations.com/michael/blog"
I forgot to mention that a couple of weeks ago, I apparently saw the last of the room that had been my office for more than 25 years, and the office suite around it — unless I have dealings with the engineering group that is moving into it, which is possible. The Institute for Artificial Intelligence has moved to the fifth floor of Boyd GSRC, and my understanding is that there will be some further minor moving while remodeling is done. Since the 1980s, the Institute (and its predecessor, Artificial Intelligence Programs) has occupied the southwest corner of the first floor (basement) of Boyd GSRC. The southwesternmost room is a large conference room; the next room to the east of it (the third window, I think) was my office. Geography determines history. At the new location, there is much less visible distinction between the Institute for AI and the Department of Computer Science, which occupies offices beside and among AI's offices; this fact may affect administrative decisions in the future. 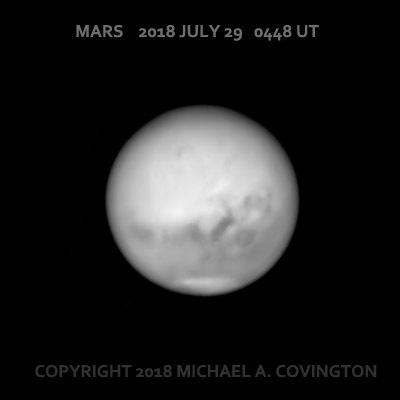 As you've probably heard, Mars is unusually close to the earth at the moment (opposite the earth in its orbit on July 27, but actually closest on July 31 because the orbit isn't a perfect circle). Unfortunately, that part of Mars' orbit doesn't rise very high in the sky as seen from here; our Australian friends are getting a much better view. You've also heard, perhaps from me, that Mars is having a planet-wide dust storm. 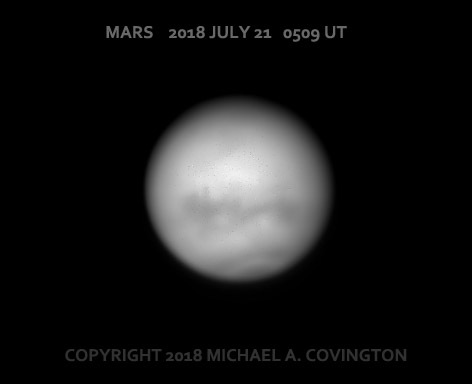 With all that in mind, let me show you some recent images of Mars, followed by a map generated with WinJUPOS. 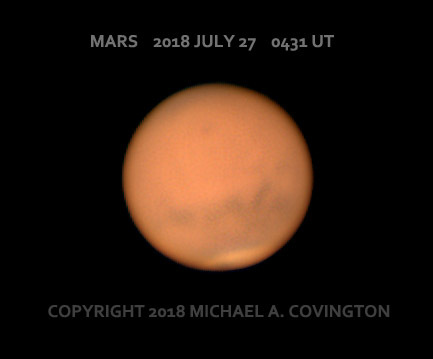 Because the rotation of Mars takes just a little more than 24 hours, pictures taken on consecutive nights show more or less the same view of Mars. The map exactly matches the last image. 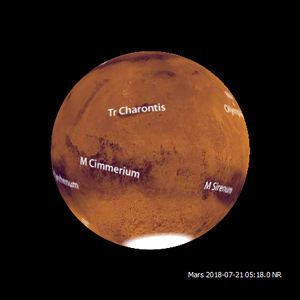 The color image shows how the dust storm is hiding surface detail; normally, the features on Mars have the highest contrast of all the planets. The black and white images are infrared images that penetrate the dust to some extent. The last image is sharpest because the air was distinctly steadier that night. You will notice that the last image shows a lot of detail but does not match the map very well. There are two reasons. One is that it's an infrared image. The other is that the visible features of Mars are mostly not landforms, but arrangements of windblown sand, and the dust storm has apparently started to rearrange them. 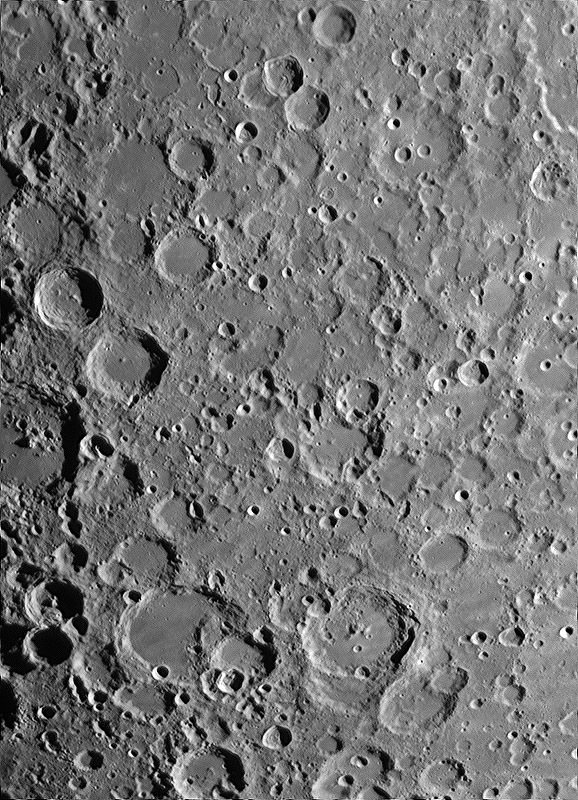 Each of these is a stack of the best 50 to 75 percent of thousands of video images, taken with a Celestron EdgeHD 8-inch telescope, 2× or 3× focal extender, and ASI120MM-S or ASI120MC-S camera. Today marks 36 years of happy marriage for Melody and me. A waiter this evening asked us what our secret was, and, caught off guard, I said, "Marry someone you like." To be precise, Melody and I were, from an early stage, best friends to such an extent that it was basically impossible for us to break up. It would have been very awkward marrying anyone else. Now, I want to emphasize that a couple can and should back out of any of these stages (except the last) if they aren't sure they're right for each other. It is possibly to seriously consider several others before finding your spouse (although neither of us seems to have actually done that). (Not:) "Going steady" with a formal commitment but expecting to break up later. I also remember an etiquette book that sternly cautioned that society does not recognize "going steady." Until you announce your engagement, you are single, and people can still introduce you to others and pair you up with others at social events. Hosts and hostesses are not expected to keep up with changing "steady couples." And that, I think, ties into the sacredness of marriage. Either you're married (or committed to marriage) or you're not. One of my curmudgeonly opinions is that some of the dating customs of the 1960s were practice for the divorces of the 1980s. "Breaking up" was, for some people, an explicit and planned step in the dating game. Stick together, not because you're that fond of each other, but just to show that you can catch someone, and then turn them loose. That is not how we did it! By the way, this is criticism of culture, not individuals. I don't fault individual high-school students for doing what the people around them do; social life can hardly work any other way. But I hope they don't make transient relationships and breakups their ideal. Now for more years! 3600 or 36,000 more would not be enough! On the evening of the 20th I also photographed some areas of the moon (ASI120MM-S camera, Celestron 8 EdgeHD without a focal extender). Due to a mistake with my software, they came out underexposed (and at the wrong bit depth), but I salvaged these pictures, which in some cases show only the most brightly lit part of the original. Besides wavelet sharpening, I used HDR processing to even out the brightness and bring out detail. 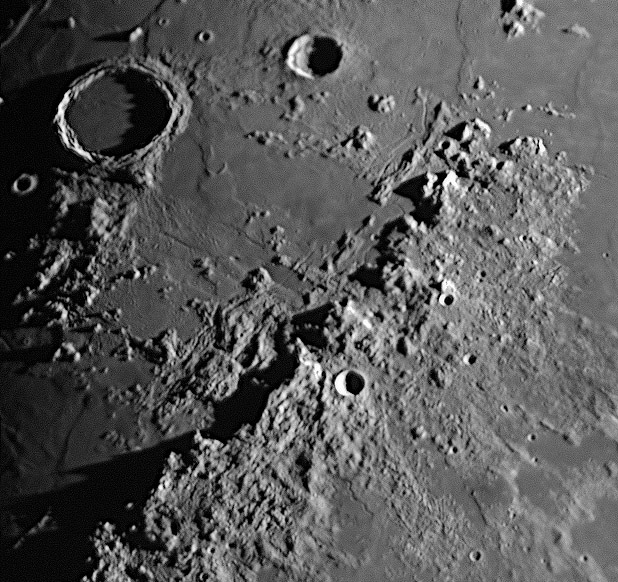 Look at the shadow of the jagged rim inside the large crater. 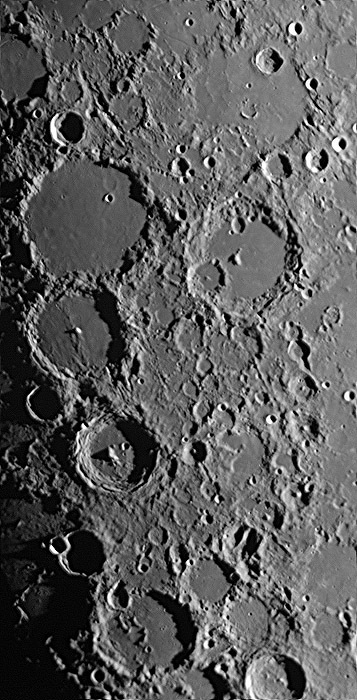 This is practically a study in crater formation; notice how many craters have formed on top of other craters. There was a time when the craters of the moon were thought to be (mostly) volcanoes, but now the best evidence is that they were (almost) all formed by meteor impacts. Because the expanding shock wave is round, the crater is circular even when the meteor hits it at a low angle. Of course, we're talking about huge rocks in very ancient times, not the kind of meteors that are common today. On the moon there is almost no erosion, so once they're formed, these impact craters stay there a very, very long time, and nothing covers them up or grows over them. There are impact craters on earth too, but they are hidden by erosion, plant growth, and geological processes. Meteor Crater in Arizona is the obvious example, but there are many others. Chesapeake Bay is thought to be one. So are the ring-shaped Lake Manicouagan in Quebec, and, among many others, the round valley containing the town of Middlesboro, Kentucky. 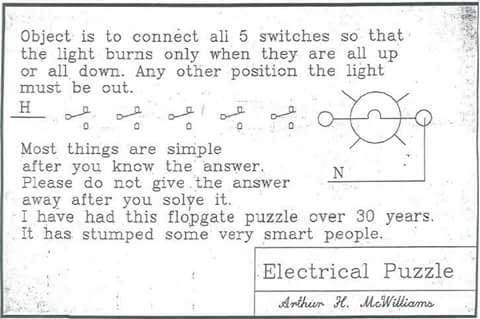 There ensued a debate as to whether the question meant the light should come on both when the switches are all up and when they are all down (but not otherwise), or in only one of those two situations, to be chosen by the puzzle-solver. Admittedly the question could have been phrased more clearly, but the second way of reading it is not a challenge, so we went with the first one. For a while, many of us believed there was no solution without adding parts (although a solution by adding diodes, with an AC power source, is evident). You can see from the diagram that each switch has to be in the same position as the previous one in order to continue the circuit. The trick is that the switches are used in a different order down than up. I don't think it's unethical to give away the answer. We teach by giving answers, not just by making people come up with them. Any individual can and should try to puzzle it out before looking for the answer. Hopefully, to some of us, the answer opens up a new class of possible solutions to consider on the (very rare) occasions when we are presented with a similar problem. And I think the key insight for discovering the solution is that the up terminal of the first switch needs to go to the up terminal of the next switch, and the down terminal of the first switch goes to the down terminal of a switch, but not the same switch. Further, if a switch has power fed into it by its up and down terminals, its middle terminal needs to go to the middle terminal of another switch. Continuing with those constraints, it is not hard to complete the solution. Does time pass more slowly on earth than in distant galaxies? As many of you know, I am a Christian but not a young-earth creationist. That is, I do not believe the universe is only 6000 years old or that science needs major reworking to reconcile it with Christianity. Nonetheless, at the request of a friend I want to respond to a proposal made by young-earth-creationist Jason Lisle for solving the starlight-in-transit problem. It turns out this is apparently from a book by Russell Humphreys that has already been refuted by Hugh Ross, so I will be brief. The problem is how we see stars and galaxies that are so far away that their light should have taken thousands or millions of years to reach us, if the universe isn't really that old. Lisle proposes that, because of Einsteinian gravitational effects, time passes much more slowly in the earth's neighborhood than in the rest of the universe. That makes it possible for light from distant galaxies to reach us. Time moves so much faster out there that they have experienced billions of years while we have only been through six thousand. I don't think Lisle's or Humphreys' application of Einstein's theory is actually correct, but it's outside my area of expertise (and the theory itself might be wrong), so I want to focus on observation, not theory. Events that take a known amount of time, such as supernova explosions, should go faster if they are in a place where time moves faster. They should go tremendously faster in distant galaxies than nearby. But in fact supernovae have been observed at a huge range of distances, from within our galaxy all the way out to very remote galaxies, and they take the same length of time everywhere. The same goes for the pulsations of Cepheid stars. So Lisle's theory fails the observational test. But there are also two problems with his logic. First: If you define "6000 years" to mean "billions of years in most of the universe," are you still claiming the universe is young? Or are you merely claiming that something distorts our experience of time? Second: As logician W. V. O. Quine has pointed out at length, you can maintain any theory in the face of any evidence if you make enough other assumptions. If you want to believe that pigs can fly, you have to assume a lot of things about why we never see them doing so. Accordingly, we have to weigh theories for reasonableness. At some point, we have to ask which is a bigger stretch, redefining time and pursuing dubious physics, or re-examining the Bible. When I look at the Bible, I do not find a clear assertion that the earth is young. In order to get the 6000-year figure from the Bible, you have to make quite a few assumptions. See David Snoke, A Biblical Case for an Old Earth, and my review of it at this link. Most of Christendom has never treated the youngness of the earth as a dogma or important doctrine. Bottom line? Both the scientific evidence and the Bible have to be approached honestly with an open mind. It won't do to decide in advance what you're going to believe and then force all the evidence to fit it. Not if your intention is to follow the evidence (of both kinds). I want to thank two fellow scientists for their input about this. I note that among young-earthers, Ph.D. degrees are very important, so I gladly acknowledge that Lisle has one; Humphreys has one; Ross has one; so do I; and so do the two colleagues I consulted. In academic work, other than on title pages, we usually do not put degrees with people's names because we view each other as equals. As you may have heard, Mars is passing unusually close to the earth right now. 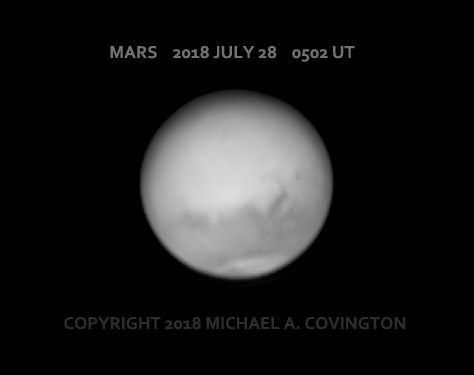 Unfortunately, as always happens, when Mars is in that part of its orbit, it is low in the sky as seen from North America. What's more, Mars is having a planet-wide dust storm. 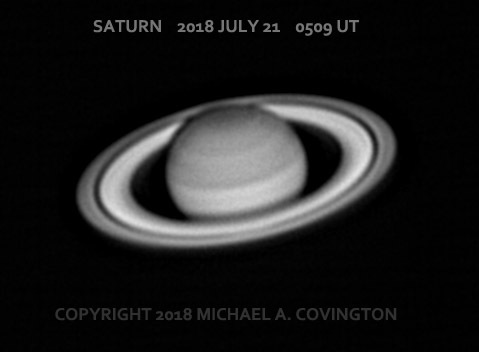 And on top of that, our weather here in Georgia isn't too good either, but on the evening of the 20th I did manage to get the telescope out and take some pictures. 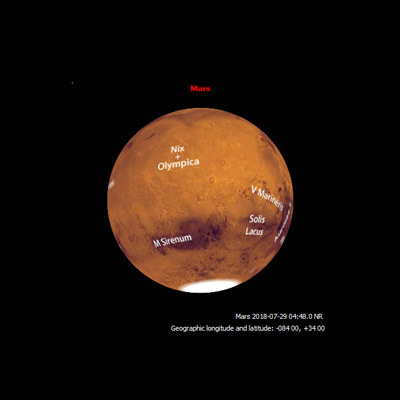 What you see above is an infrared image of Mars and, for comparison, a labeled map generated with WinJUPOS. Using an 8-inch Celestron EdgeHD telescope, 3× extender, ASI120MM-S camera, I captured a whopping 7000 video frames and stacked several thousand of the best. You can see that Mars is dusty. I used infrared to get through the dust. Because the features are largely due to windblown sand and dust rather than topography, they do change from year to year; also, they are not quite the same in infrared as in visible light. 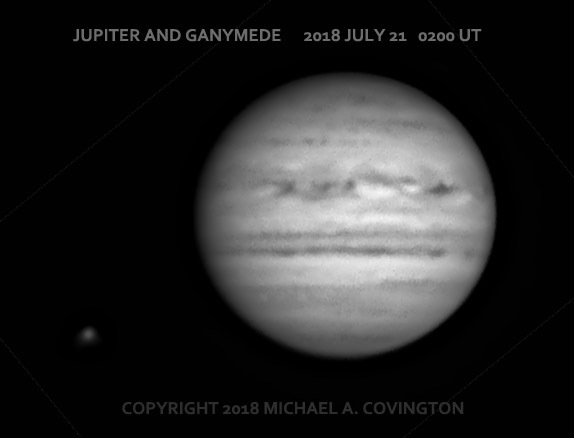 Earlier the same evening, I got two images of Jupiter (same equipment, same method) about 50 minutes apart. 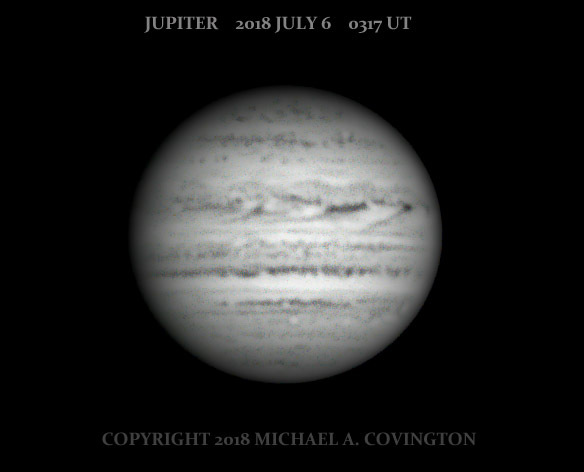 You can see how fast Jupiter rotates. The satellite is Ganymede. The orbital motion of the satellites impressed Galileo — you can see movement in just a few minutes. 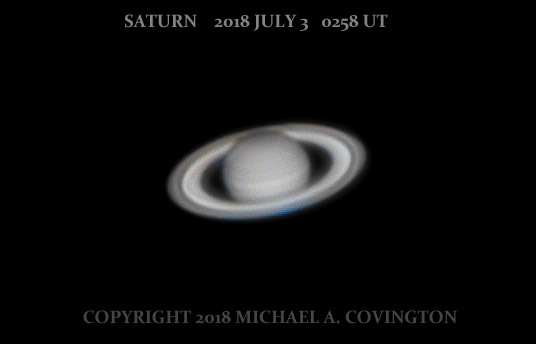 I also got a presentable picture of Saturn (not showing any unusual activity; some of the streaks on the rings may be processing artifacts). This picture is grainier because Saturn is not as bright, so I had to increase the amplification in the camera. Here's the grand finale from my July 8-9 Deerlick expedition. 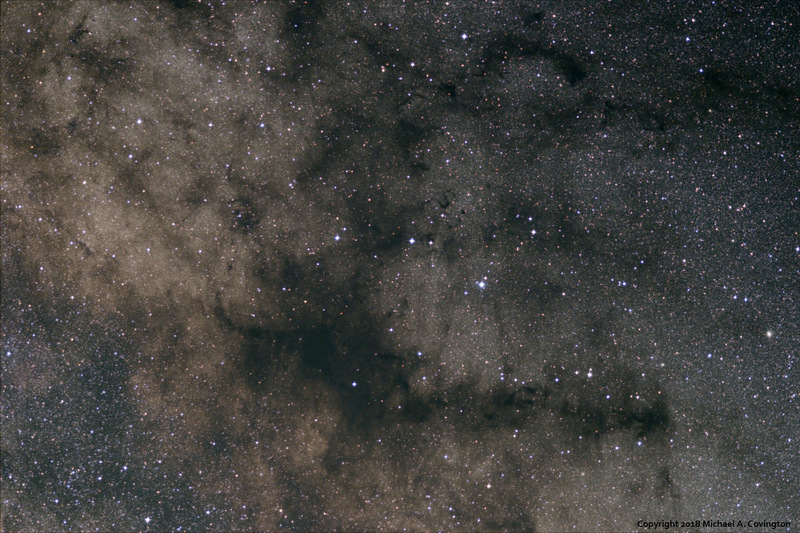 This is a wide field in southern Scorpius; the second picture is an enlargement of part of the first. 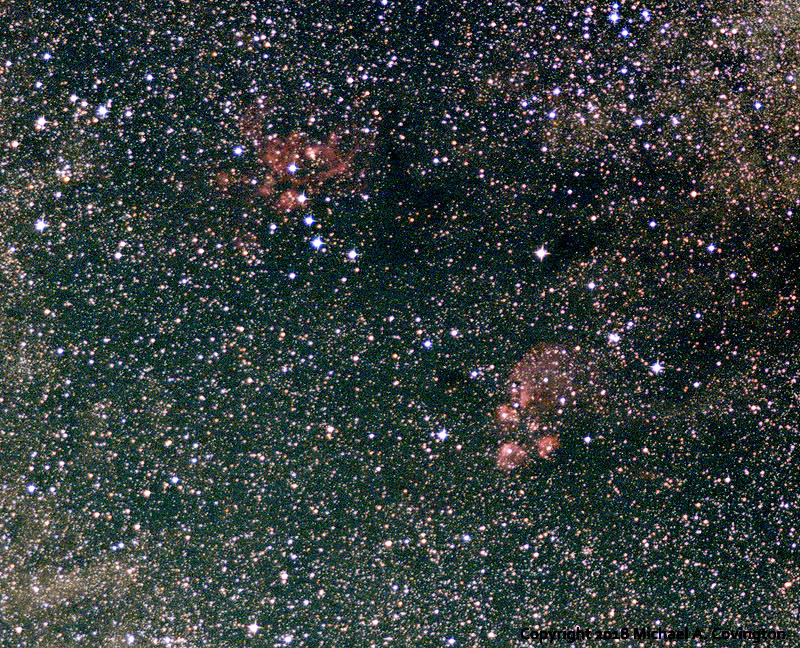 In both, the Cat's Paw Nebula (NGC 6334) is the most prominent red object, with another nebula, NGC 6357, to its upper left. Both are thin clouds of hydrogen glowing red because of starlight striking them. 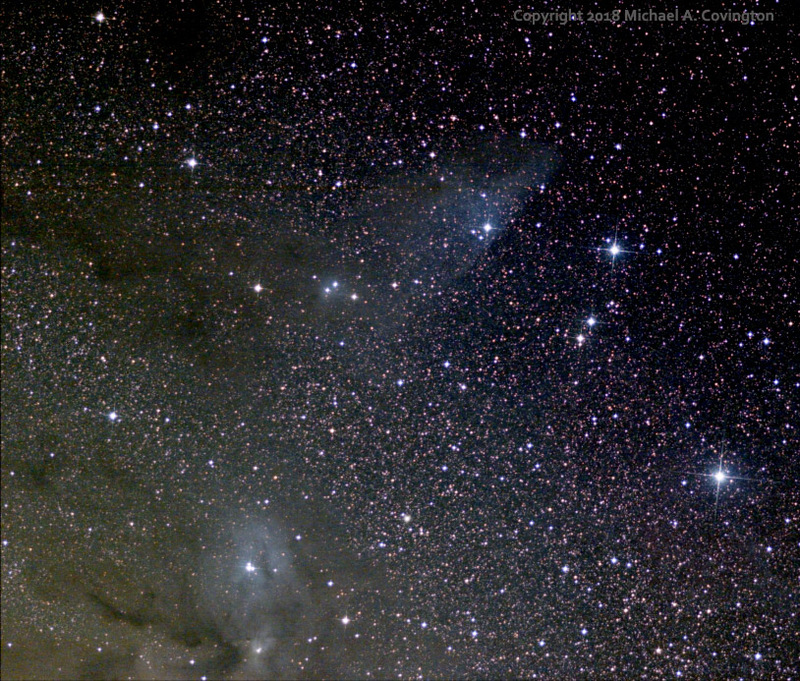 The larger picture takes in a wider view and includes many star clouds and dark nebulae. Stack of seventeen 1-minute exposures, Canon 60Da, ISO 800, Sigma 105/2.8 lens, iOptron SkyTracker. The Deerlick pictures continue. This is a field in central Scorpius (and part of Ophiuchus) that is not dominated by any single major object other than a bright star cloud. You can see the "stem" of the Pipe Nebula at the upper left, cluster NGC 6383 with some red nebulosity at the lower left, globular cluster M19 like a big slightly fuzzy star at the top right, and globular cluster M62 about halfway up the right side. At the lower right corner are the compact dark nebulae B50 and B53 and, between them, the star k Scorpii (not kappa — there's a kappa elsewhere — we're far enough south for Lacaille Roman letters here, and too far south for Flamsteed numbers). There are many other interesting objects in the picture. Stack of thirteen 1-minute exposures, Canon 60Da, ISO 800, Sigma 105-mm f/2.8 lens, iOptron SkyTracker. How we got "k Scorpii"
Northern-hemisphere astronomers are accustomed to referring to bright stars by name (Vega), Greek letter (Alpha Lyrae, more precisely α Lyrae), or Flamsteed number (61 Cygni). The names are ancient; the Greek letters go back to Johannes Bayer's Uranometria, a star atlas published in 1604; and the Flamsteed numbers are the work of a British astronomer published in 1725. Further, Bayer's system isn't just Greek letters — after using up the Greek alphabet, Bayer continued with Roman (Latin) letters. But the usual practice is to ignore these; after the 24 Greek letters in each constellation, Flamsteed numbers are used. For stars too far south to be visible from Europe, that system breaks down. 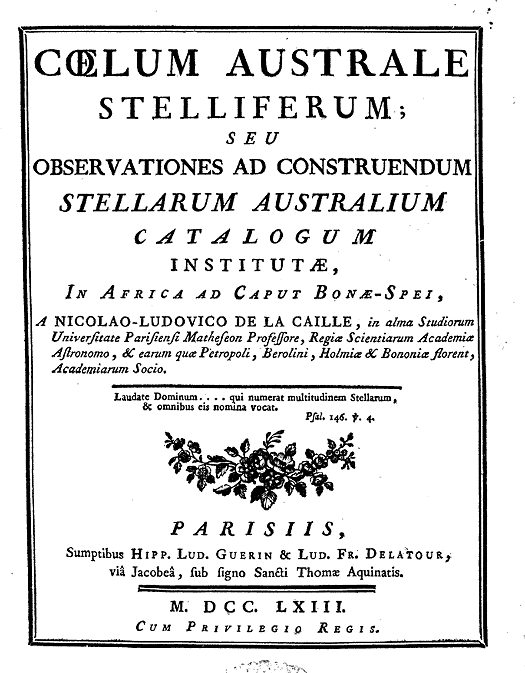 Bayer did have some preliminary coverage of the far southern sky, but Flamsteed did not. Bayer's system was extended to the far south, with copious use of Roman letters, by Lacaille in the 1700s. There were brief attempts to extend Flamsteed's numbering too, but they didn't catch on. So in the far southern sky, you don't see Flamsteed-style numbers in a star atlas; you see Bayer-style letters, including Roman ones. That brings me to k Scorpii. The designation is obviously Bayer-style, but did Bayer, Lacaille, or someone else actually pin it on the star? k Scorpii (not capitalized; K Scorpii, if it exists, is a different star) is too far south for Flamsteed but not entirely too far south for Bayer; his charts do cover that part of Scorpius. To investigate further, I first looked up Bayer's Uranometria on line. It's a beautiful atlas — I recommend that you browse through it — but it doesn't show k Scorpii. Case closed. The "Bayer designation" k Scorpii was assigned by Lacaille. Case reopened. I could have found all this out much more quickly from the book Lost Stars, by Morton Wagman, which I consulted today at the library. Wagman lists all the Bayer and Flamsteed designations, as well as extensions of them by Lacaille and others, and comments on how the usage varied in star atlases through the years. The full set of designations didn't really settle down until around 1950; until then, maps did not all agree, and as recently as 1879 the southern Bayer and Lacaille designations were substantially cleaned up by Benjamin Gould. Yet another picture from the Deerlick expedition. This is the Pipe Nebula, a dark nebula (dust cloud) in front of clouds of stars in the Milky Way in the constellation Ophiuchus, just to the upper left of Scorpius in our southern sky. I photographed it well in 2010, but I think this picture is even better. Stack of twenty 1-minute exposures, Canon 60Da, ISO 800, Sigma 105/2.8 lens, iOptron SkyTracker. 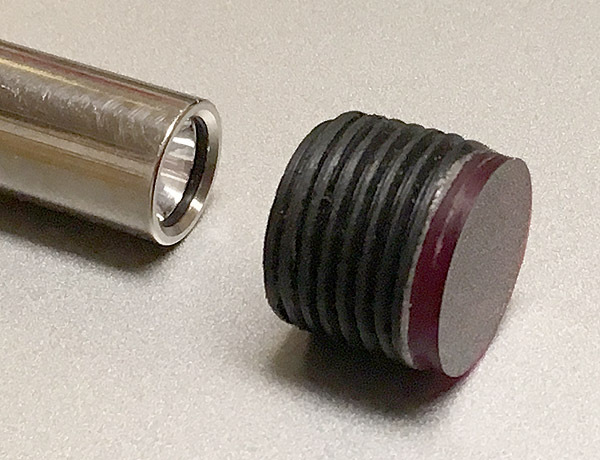 Yesterday I made a piece of apparatus that I needed, but didn't have, at Deerlick: a red night-vision cap for my excellent ThruNite penlight. I like the Thrunite because it is small, easy to handle, and very bright, has a beam width that is convenient for many kinds of work, and has three widely differing brightness settings — ideal for use on the field because the lowest is usually sufficient, but the highest might sometimes be needed to confront an animal or look for lost objects on the ground. Thrunite does not made a red version of it. Anyhow, a removable cap is better because in a real emergency, I can take the cap off and get really bright white light. I had previously used a translucent red vinyl cap, but it spreads the light out and dims it too much. I wanted something transparent. 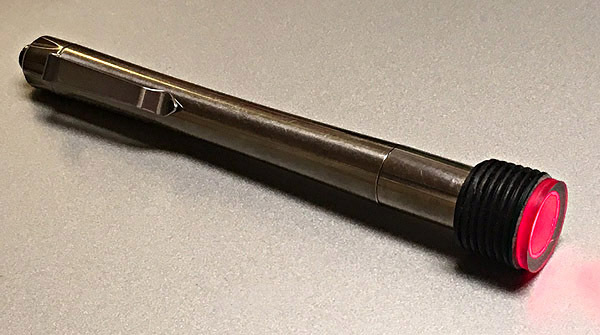 (1) Looked around Home Depot for a plastic plumbing part that had the right inside diameter to fit the penlight snugly, and was dark colored (to avoid spreading white light out the sides). I settled on a black sprinkler riser that was threaded for 1/2" pipe on the outside; the inside is what matters. (2) Cut off the end of the plastic pipe (I used a scroll saw) and squared it up by sanding. (3) At this point I also put the piece of pipe on a metal rod that it fit snugly and turned it in my drill press. I sanded it more (to make the threads shallower) and then buffed it with a very old buffing wheel (possibly the last surviving accessory from my parents' 1964 Kirby). This step is optional. (4) I cut a disk of red acrylic to the right diameter. This was done with a fly cutter (circle cutter) with the central drill bit omitted — which works if you are using a drill press with a drill press vise and proceed carefully. (To adjust diameter, make test cuts in a piece of scrap wood or plastic.) This is the main thing here that was new to me — I spent some time thinking about how to cut disks, and now that I can do it, quite a few flashlights are probably going to get red windows put on them. I don't remember where I got the red acrylic. It is the same kind as people use in front of computer screens when doing astronomy. For years I've known of its usefulness and have saved scraps, including scratched and broken scraps. It used to be used for windows on digital devices with red LED displays, back when all LEDs were red. (5) I glued them together with a thin coating of J-B Weld Plastic Bonder, which sets much more slowly than J-B says — mine took about two hours to reach full hardness. Here are two different renderings of the same picture, differing only in the contrast adjustments at the last step. 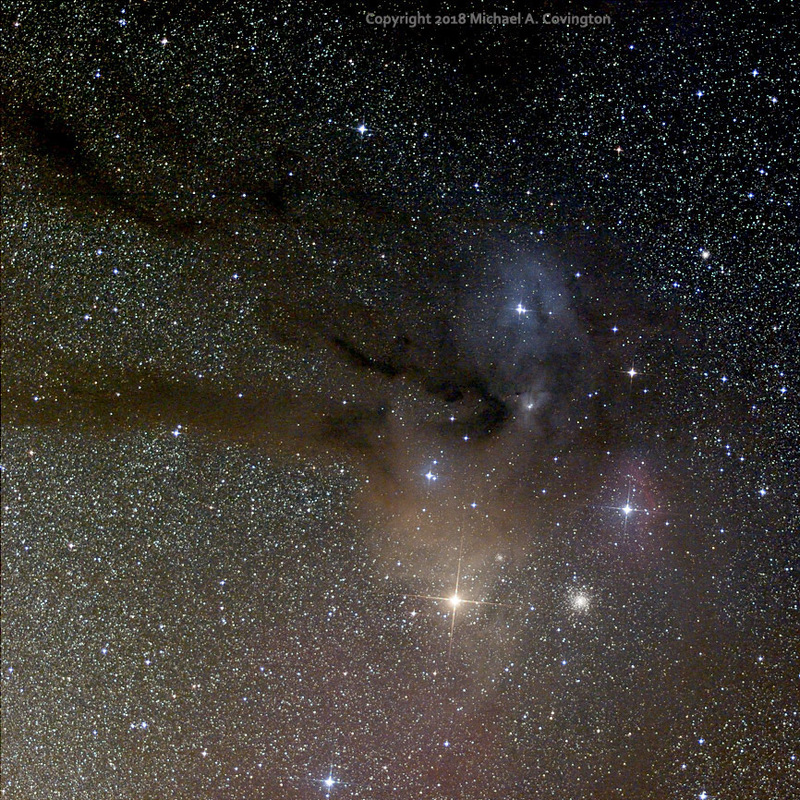 You're looking at the region of Antares and Rho Ophiuchi, one of the most dramatic parts of the Milky Way. There's some of everything here. Clouds of stars, of course; some bright stars, of which the brightest is Antares, lower left corner of the dramatic pentagon; globular clusters, including M4, which is the lower right corner of the pentagon, and NGC 6144, inside it; and nebulosity. Emission nebulosity (fluorescent gas) is red; interstellar dust ranges from brownish (if the particles are large) to blue (if they are small); and some interstellar dust is not illuminated at all, showing up as dark clouds in front of stars. Stack of twenty 1-minute exposures, Canon 60Da, ISO 800, Sigma 105-mm f/2.8 lens, iOptron SkyTracker, at Deerlick. I've tried several times to photograph the faint cloud of gas and dust around the star Nu Scorpii, and this time I've done it moderately well. 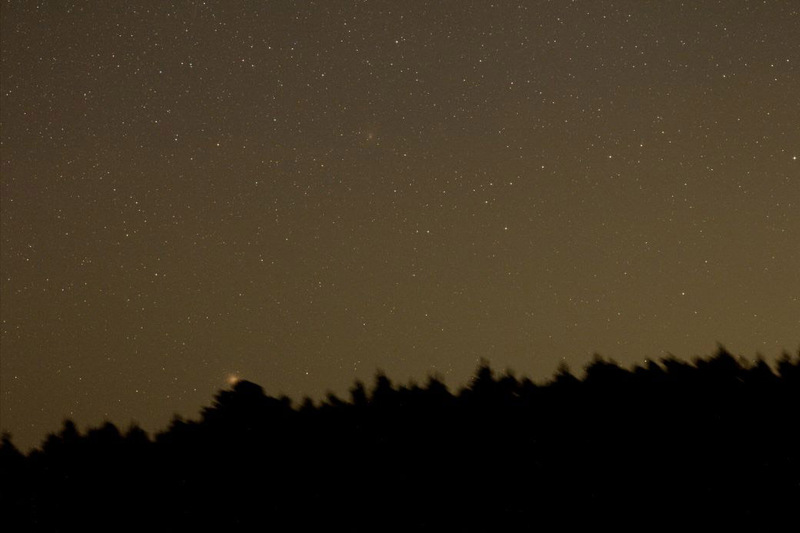 Stack of fifteen 1-minute exposures, Canon 60Da at ISO 800, Sigma 105-mm f/2.8 lens, iOptron SkyTracker, at Deerlick. 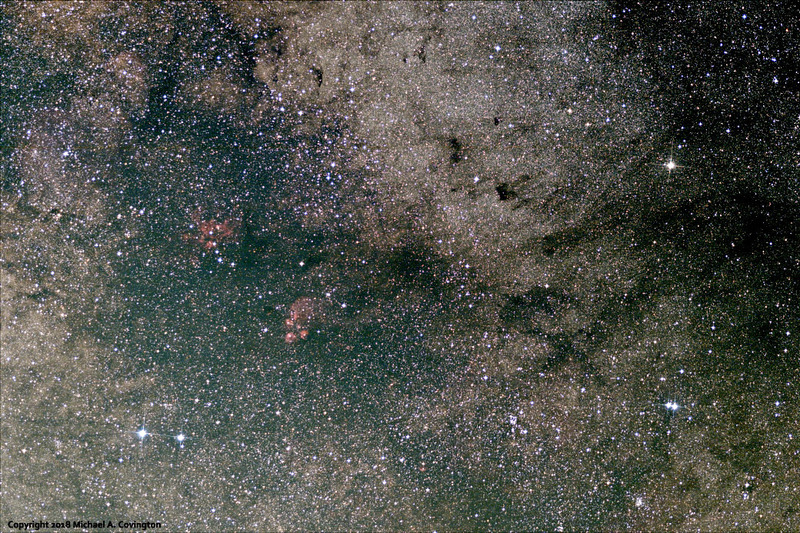 Nu is the star at upper right of center, immersed in a bluish cloud, the nebula IC 4592. The bright, cloudless stars at the right are Beta and Delta Scorpii; Delta is lower and brighter, but until a few years ago, it was not as bright as Beta; this is the only constellation whose visible appearance has changed noticeably in my lifetime. To the lower left of Nu, just to the upper left of the center of the picture, is a pair of stars immersed in another bluish reflection nebula, IC 4601. 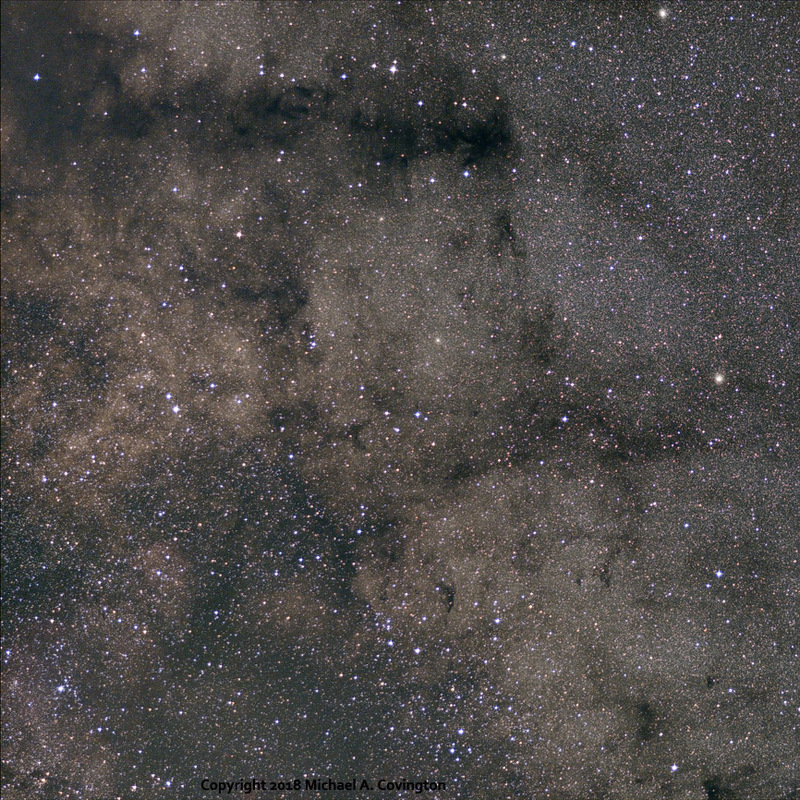 To the left and lower left you can see thicker interstellar dust, sometimes reflecting light with a yellowish or brownish hue, and sometimes blocking it altogether and appearing black. At the bottom left is Rho Ophiuchi, whose thick complex of dark nebulae and reflection nebulae we shall see again tomorrow. And avid users of star maps can confirm that one star, halfway from the center of the picture to the bottom, is actually the globular cluster M80. Time for me to start showing you the pictures I took at Deerlick, starting with the least impressive ones. Before the sky was completely dark, on each night I took a few pictures as tests of the equipment. You've already seen one, of Omega Centauri skimming the treetops (scroll down). Here's another. To the northeast of the constellation Leo is a star cluster that has been designated since ancient times as the constellation Coma Berenices (the hair of Queen Berenice of Egypt, sacrificed to the gods; the only ancient constellation that commemorates a real event). Here you see a stack of eight 1-minute exposures with a Canon 60Da at ISO 800 and a Sigma 105-mm f/2.8 lens. The slight diamond-shaped patterns on the brighter stars are produced by wire crosshairs in front of the lens, which I installed semi-permanently several years ago and have used ever since. A distant galaxy is visible, halfway up, about 20% of the way from the left edge to the right. It is NGC 4565, thin and spindle-shaped. 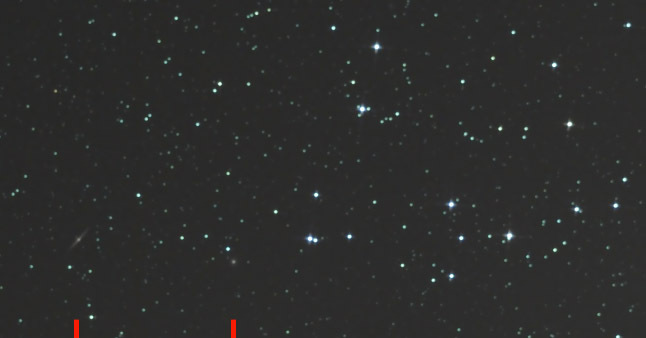 See also the enlargement below, which you can see this and another galaxy, NGC 4494, which looks like a fuzzy star, above the red marks. 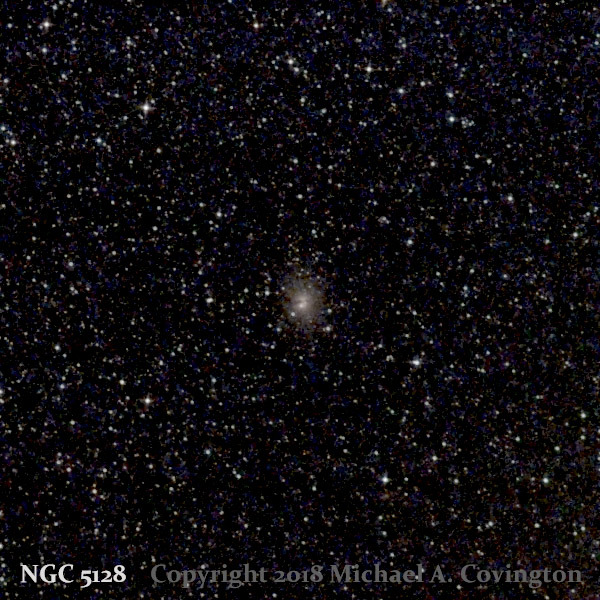 I must emphasize that this is a poor image, taken with only one inch of aperture — my goal was to depict Coma Berenices as a whole, not to capture these galaxies. But there they are. Do you recognize this galaxy? Another of my tests during twilight gave me a recognizable (not great!) picture of a galaxy that is normally considered too far south to photograph from Georgia. This is Centaurus A (NGC 5128), a round ball with a dark belt of dust across it. It is also faintly visible in the picture of Omega Centauri that I photographed a few days ago. This is a stack of 14 1-minute exposures; the galaxy was just above the treetops, and the sky wasn't completely dark. For a much better picture of it (not mine) click here. Every month, Sky and Telescope has a "75, 50, and 25 years ago" section. I wondered how soon I would start recognizing things in the 50-years-ago section. This month it happened. 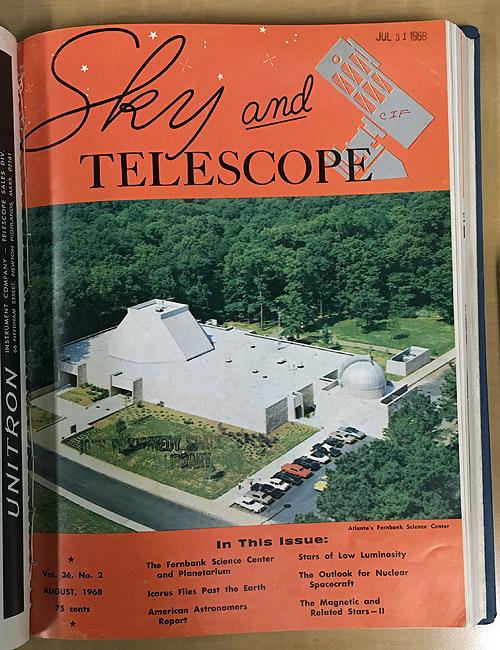 The August 2018 issue has a tiny picture of the August 1968 front cover, which depicts Georgia's Fernbank Science Center. Opened in 1967 with a large donation of land and money, Fernbank is a part of the DeKalb County school system. It has a Zeiss planetarium, a 36-inch Tinsley telescope, an electron microscope, and a library, and is situated in a protected forest. Melody went there regularly in elementary school, and particularly in seventh and eighth grades. I went there (from Valdosta) a couple of times: in the fall of 1968 (for a planetarium show given by someone with a German accent, presumably Dr. Staal) and, as best I recall, the fall of 1972 (with a Valwood biology class, to use the electron microscope). It still operates, of course, and I've been there several times recently. It was obviously better funded in its early days than today, but it's still doing OK. I saw this issue of Sky and Telescope when it was being circulated around the Department of Physics and Astronomy at Valdosta State College and I was hanging out there as a middle-schooler. It may have been the first issue of Sky and Telescope I ever saw. Above you see the University of Georgia's copy. Curiously, it belonged to the Kennedy Space Center (whose name is stamped on it). At the time, Valdosta State had at least two subscriptions of its own; didn't UGA? One other point of curiosity. Inside the issue, there's a picture of a long table in the Fernbank library with what appear to be ashtrays on it. Now, I know that was 1968, but even in those benighted times, it was not customary to permit smoking in libraries (because of the fire insurance costs) or K-12 schools (which Fernbank was). I wonder if someone who remembers Fernbank in the 1960s can let me know what those round things on the table were, if not ashtrays. After a nearly two-year hiatus I am again able to go to Deerlick for dark-sky astronomy. On July 8th I had Grier's Field all to myself (and didn't even have to red-filter my camera and flashlight); on the 9th I shared it with about fifteen people. We had a rare break in our humid, cloudy July weather; it was clear and dry and got down to 68 F late at night. Pictures are coming. I was glad to discover that my favorite location (at the northeast corner of the field) now sports three new concrete pads with electricity, as well as a proper driveway entrance (not just a place where we might or might not be allowed to drive onto the road). Above you see my equipment on the field. What, no telescope? No; just a camera on an iOptron Skytracker. Light, simple, and it did the job, for what I wanted to do. And Zeiss 10×42 binoculars, which I had never used on a field trip before. (I bought them for the eclipse and accidentally left them out of reach during totality!) They gave a great view. As I think I've mentioned, the newest Zeiss binoculars give a brighter image than earlier binoculars of similar design; some problem relating to polarization and partial reflection has been overcome. I was able to see M51, M81, M82, M27, and (more surprisingly) the Cat's Paw Nebula with binoculars the second night. For the amusement of my friends in the Southern Hemisphere I present this example of what the great globular cluster Omega Centauri looks like from here. It does rise a little higher, actually, but only for a few minutes out of every 24 hours, and those few minutes occur in darkness between dusk and midnight only in the late spring. They had occurred during twilight on this particular date, and by the time it was dark enough to take this picture, the cluster was disappearing into the trees. Optimists will say this is proof that our sky at Deerlick was clear all the way down to the horizon. The cluster's calculated altitude at that moment was 3 degrees. 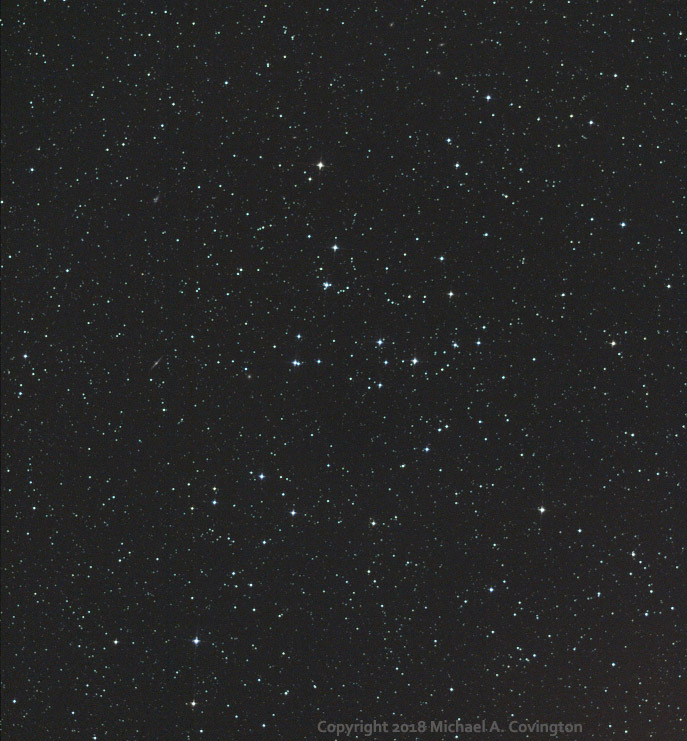 Single 1-minute exposure, Canon 60Da, Sigma 105-mm f/2.8 lens at f/4, iOptron SkyTracker, no calibration. 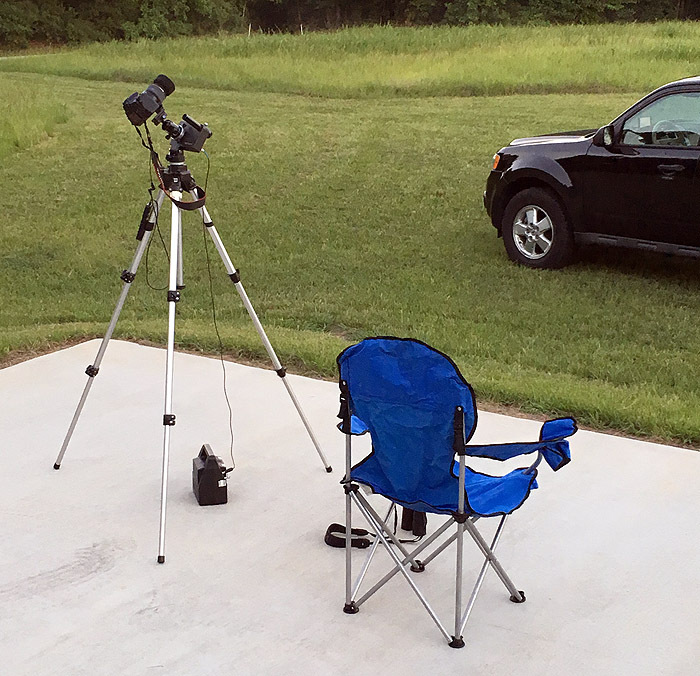 Thanks to Eric Teske's excellent blog entry (and Darrell Golliher, who pointed me to it) I no longer need red plastic over my iPhone screen during dark-sky observing sessions. 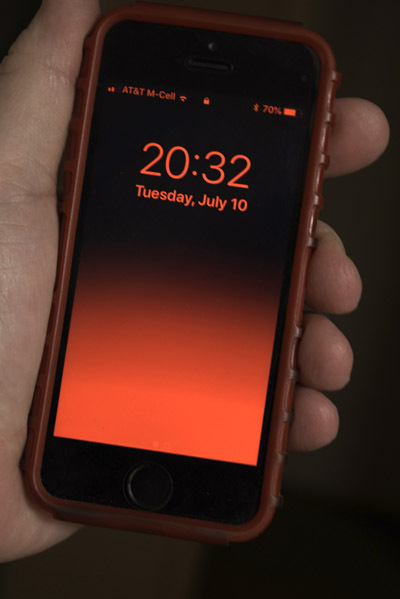 The iPhone can turn its display red all by itself. And the display automatically goes to minimum brightness in dark surroundings. What's more, I can turn red mode on and off by pressing the Home button 3 times quickly. In brief, here's how it's done. (1) Settings, General, Accessibility, Display Accommodations (On), Color Filters. (2) Switch Color Filters on. (3) Scroll all the way to the bottom. Choose Color Tint. (4) Scroll even farther down and put the Hue and Intensity sliders and put them both all the way to the right. Now your display is red. (5) Now back up to Settings, General, Accessibility. Scroll down to the very bottom and open Accessibility Shortcut. Check Color Filters. Now 3 quick presses of the Home button will turn the red mode on and off. This worked with my iPhone SE. I do not know what models and iOS versions support it. Just six miles northeast of Gwinnett Place Mall, whose slow and sad decline I wrote about recently, is an even bigger shopping mall that looks as prosperous as can be. It is Mall of Georgia (shown above). My peregrinations took me there yesterday, and I was startled. Not only is the mall full of stores and people, it is surrounded by several thick, prosperous layers of outside shops. What's the difference? I don't know. Were the two managed very differently? Did this one (opened 1999) simply take all the business away from several others, dating from the 1980s? If so, what made it better? 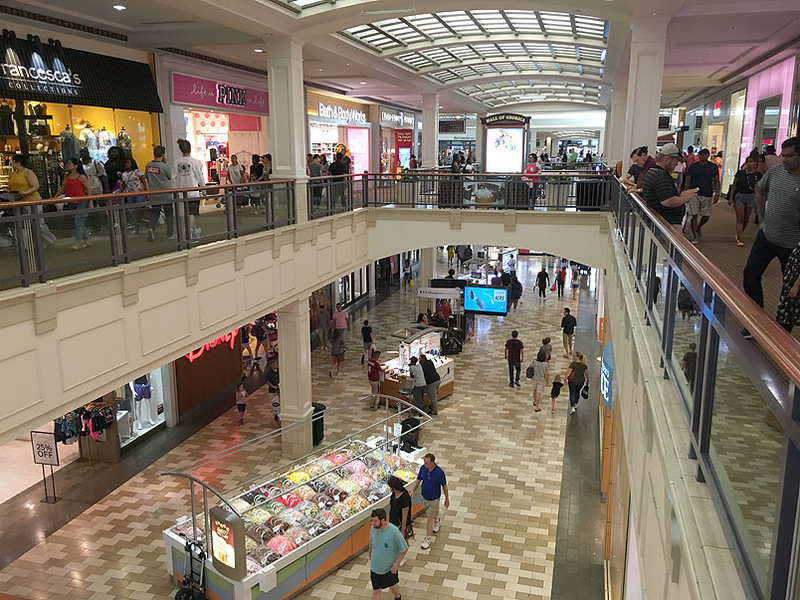 Maybe a critical mass of high-end and specialized stores, so that it's not just 10 purveyors of athletic shoes and 30 of cheap clothes for teenagers, which is what other malls seem to be turning into? Anyhow, this leads me to a theory: Malls were overbuilt in the 1980s. There were simply too many. When we get back down to the number of them that existed around 1975, all the remaining ones will be doing well. It is fashionable nowadays to say you don't like malls. But I use them regularly as indoor exercise venues (for walking without getting out in the rain or the sun) and occasionally even shop there. 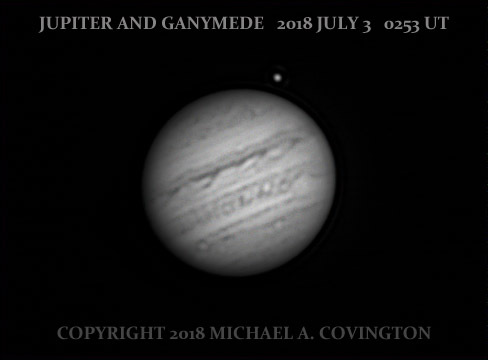 I'm surprised at how much fine detail I captured in this very hasty shot of Jupiter. 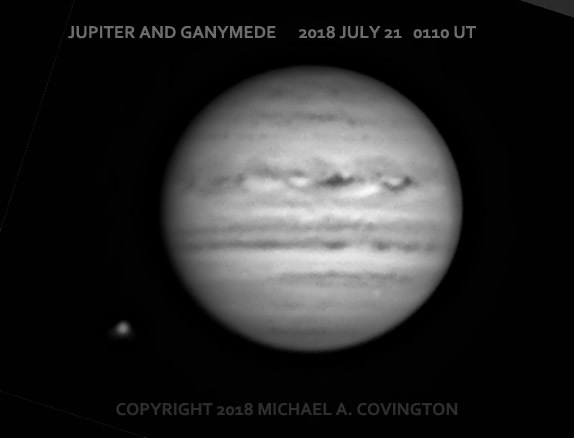 Celestron 8 EdgeHD, 3× extender, Baader IR-pass filter, ASI120MM-S camera, while dodging clouds and humidity on the evening of July 5th. Best 75% of about 5000 video frames. About once every ten years (well, nine) I actually get to take a day off. 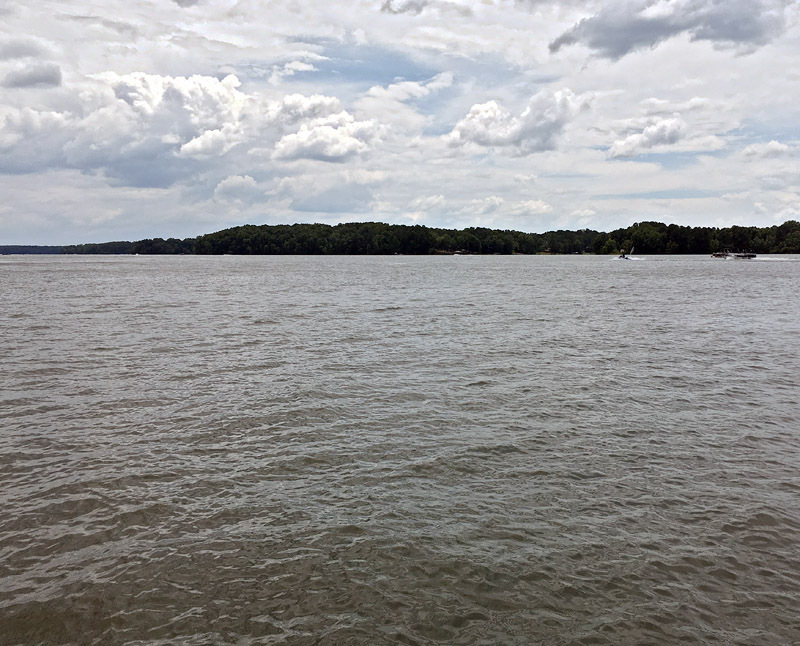 Today Melody and I went to a gathering of Melody's extended family at the home of her uncle, Warren Barnett, on Lake Oconee. Along the way, our GPS found us a useful shortcut via Salem Road, which is midway between Highway 441 (too far west) and 15 (too far east). Seriously, with Melody's health improving and my big book project done, I'm starting to reach the point of not being overworked — for the first time in a very long time. I'm only working slightly more than one job (depending on how you count the consulting activity). How long it will last until the next calamity, I'm not sure. But I'm being very careful about not getting roped into things. "Retired" does not mean "works for free." The picture above was taken with an iPhone and then given HDR processing in PixInsight to manage the overall tonal range. Finally, some pictures taken with my newest camera, an ASI120MM-S. These were taken in great haste with my 5-inch Celestron (vintage 1980) and a 3× extender, dodging clouds during a brief clear interval with unsteady air. I think they're quite creditable given the small size of the telescope and the poor conditions. They were taken with an infrared filter (IR-pass) because the air is steadier in infrared than in visible light, and I needed all the help I could get. An American researcher did a study of diets and cholesterol and submitted an article about it to the Annals of Internal Medicine. It was a follow-up to an earlier report that had been published in another major journal. The Annals did what every research journal does when an article is submitted: they sent it to several (probably 3) anonymous reviewers. These are other researchers who do not work for the Annals but are called on as volunteers. They are usually people whose other research has been published in the same journal, or who are reasonably well known in the field. I do about three anonymous reviews per year myself for various journals. The reviewers' job is to rate the article to help the Annals decide whether to publish it. They are required to keep it confidential. They cannot use information from it, even to further their own research, until it is published or made public somewhere. And the person whose work they are reviewing is not told who they are. In this case, the Annals turned down the article, and then, a few months later, the author found that it had been published under a different author's name in an European journal. (Other people's names and the location of the study had been altered.) He contacted the Annals and confirmed that the fake author of the European article was one of the anonymous reviewers. The reviewer had stolen it and passed it off as his own work. Why he thought he would get away with that is unclear. Anyone seriously researching the subject would be sure to find not only the European article, but also the real author's earlier study, and see the uncanny similarity between the two research projects. The European journal published a retraction. The Annals reported what had happened and published a statement by the victim. At that point I was thinking that one more thing needs to happen. The Annals needs to publish the original paper, preferably after allowing the author to update it. The reason is that (1) the author deserves to have it published in a reputable journal under his own name, and (2) only the Annals can do that, since after all this, it isn't publishable anywhere else. Around mid-year they got a letter to the editor from someone saying they should do exactly that. They declined, on the ground that the original paper did not meet their standards — it was not enough of an addition to the report that had been published earlier elsewhere. I think they should reconsider. I understand that publication in the Annals is very competitive, but it may be time for them to eat some costs, so to speak. The harm was done by their anonymous reviewer, who, though not an employee, was acting on their behalf, and not at all under any control by the victim. That gives the Annals more responsibility than if this had all been done by a third party. The victim needs to be made whole. I think it is better to err on the side of publishing a second-rate paper (which is not flawed or erroneous, just less important than most of their papers) than to leave the paper unpublished and unpublishable. It's like accidentally knocking over a statue in a museum: even if you think it is a second-rate or third-rate statue, when you break it, it's your problem. In all of this I've been ignoring the co-authors. Both the real article and the fake one have co-authors. The co-authors of the real one are victims, alongside the main author. The co-authors of the fake one either share in the guilt or had their names used without their knowledge. Many journals require the signatures of all co-authors on the submission paperwork, but this is not yet universal practice, and in any case signatures can be faked. This should be looked into. This is a private web page, not hosted or sponsored by the University of Georgia. Copyright 2018 Michael A. Covington. Caching by search engines is permitted. and if you get the previous month, tell your browser to refresh. Portrait at top of page by Krystina Francis. In compliance with U.S. FTC guidelines, I am glad to point out that unless explicitly indicated, I do not receive substantial payments, free merchandise, or other remuneration for reviewing or mentioning products on this web site. Any remuneration valued at more than about $10 will always be mentioned here, and in any case my writing about products and dealers is always truthful. Reviewed products are usually things I purchased for my own use, or occasionally items lent to me briefly by manufacturers and described as such. I am an Amazon Associate, and almost all of my links to Amazon.com pay me a commission if you make a purchase. This of course does not determine which items I recommend, since I can get a commission on anything they sell. If what you are looking for is not here, please look at previous months .